LEGAZPI CITY, July 14– Governor Joey Salceda has placed the province of Albay under preparedness status as of 12:00 pm today after the government weather bureau declared the province under public storm warning signal number 2 as tropical storm Glenda intensifies. In the latest advisory of the Provinical Disaster Risk Reduction and Management Council in Albay, Salceda has likewise suspended classes at all levels for both public and private schools. The same advisory has directed all local DRRMCs to activate their respective Operation Centers for preparedness meeting and close monitoring of weather bulletins and PDRRMC advisories through infoboard and for timely application of countermeasures for disaster avoidance in their respective jurisdiction. Salceda further reiterated his call for residents along river system and steep slope are advised to pre identify safer grounds and facilities for possible evacuation in case of flood and landslide for disaster avoidance. They are also advised to monitor Albay PDRRMC Smart Infoboard and local broadcast stations for regular and periodic issuances of further emergency advisories. No sailing policy has likewise been declared for all fishing vessels and passenger sea crafts. In the latest Philippine Atmospheric, Geophysical and Astronomical Services Administration or Pagasa weather advisory, TS Glenda has intensified further as it continue to move in a westward direction at 28 kph threatening the Bicol region. 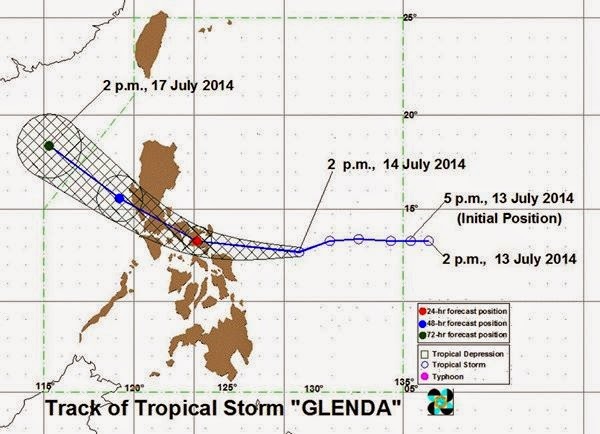 As of 10:00 am today, the center of TS Glenda is estimated at 620 km East of Virac Catanduanes with a maximum sustained winds of 95 kph near the center and gustiness of up to 120kph.